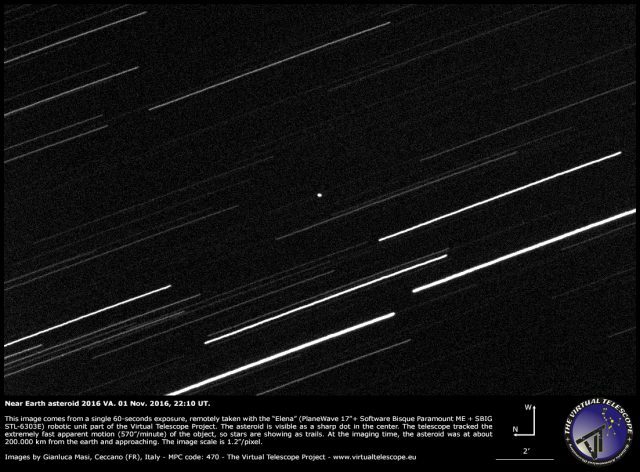 The near-Earth asteroid 2016 VA was discovered by the Mt. Lemmon Sky Survey in Arizona (USA) on 1 Nov. 2016 and announced later the same day by the Minor Planet Center. The object was going to have a very close encounter with the Earth, at 0.2 lunar distances (about 80.000 km). At Virtual Telescope Project we grabbed extremely spectacular images and a unique video showing it eclipsed by the Earth. The image above is a 60-seconds exposure, remotely taken with “Elena” (PlaneWave 17″+Paramount ME+SBIG STL-6303E robotic unit) available at Virtual Telescope. The robotic mount tracked the extremely fast (570″/minute) apparent motion of the asteroid, so stars are trailing. The asteroid is perfectly tracked: it is the sharp dot in the center, marked with two white segments. To get these impressive results, the Paramount ME robotic mount tracked using the ephemerides retrieved via the JPL’s Horizon webserver. At the imaging time, asteroid 2016 VA was at about 200.000 km from us and approaching. Its diameter should be around 15 meters or so. During its fly-by, asteroid 2016 VA was also eclipsed by the Earth. We covered the spectacular event, clearly capturing also the penumbra effects. The movie below is an amazing document showing the eclipse. Each frame comes from a 5-seconds integration. The eclipse started around 23:23:56 UT and ended about at 23:34:46. To our knowledge, this is the first video ever published of a complete eclipse of an asteroid. Some hot pixels are visible on the image. At the eclipse time, the asteroid was moving with an apparent motion of 1500″/minutes and it was at about 120.000 from the Earth, on its approaching route. You can see here a simulation of the ecplise as if you were on the asteroid. Very cool! God job Dr. Masi. How fast was the asteroid travelling and what would be the impact results upon hitting the earth? Hi, it was traveling at about 21 km/s relatively to our planet. Its size could make another Tunguska event; a similar size object was involved in the Chelyabinsk event. Previous story 14 Nov. 2016 supermoon: the largest full Moon in more than 80 years.